Unique Luxury Villa, American Style Log Cabin imported from North Carolina. The villa is located just outside La Canalosa, between the towns of Hondón de las Nieves and Hondón de los Frailes 30 minutes from Alicante airport and the Costa Blanca beaches. A long driveway with electric gates you enter the property to the imposing villa. The Villa; There is a large living-dining room which leads into the large modern kitchen with French doors to the rear of the house. Through the kitchen you enter the utility room and garage. 2 bedrooms and 2 bathrooms on the ground floor. The master bedroom has a large bathroom with a Jacuzzi bath, a large shower, walk-in wardrobe. The 2nd bedroom has a small suite with private entrance, a beautiful bathroom with double sinks, a tub and a shower. This part of the property could be used for guests (or renting out). The staircase in the kitchen leads to the mezzanine of the first floor which gives you a great view across the living room on the ground floor. The loft is furnished with a seating area where you can retire in peace with a good book or enjoying music. On this floor there are three bedrooms, one with private balconies and great views over the valley and the mountains, and three full bathrooms. The villa has a large shaded porch / decking around the entire house. On the right side of the house there is a porch, a bar, a large dining table to enjoy with your guests the balmy evenings, a lounge section and a real climate-controlled wine cellar / bodega with spiral staircase. From the porch it leads to the luxurious lagoon-style heated pool (10 x 6) with a waterfall wall, here is also the extra guest / pool casita. The casita; an open space decorated as a bedroom with open plan living dining kitchen and a private bathroom. The gardens surrounding the villa are beautifully decorated, there is a large underground storage for golf lovers there is a mini driving range, to improve your swing. The villa has: permanent water and electricity, oil central heating, air conditioning, a very large fireplace, double garage, double carport, underground storage room, wine cellar, internet, sat. 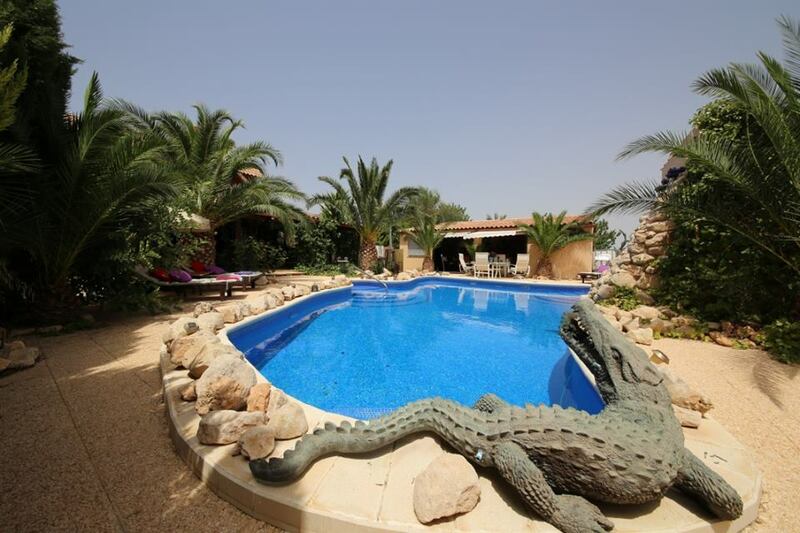 TV, telephone, a guest / pool casita, 10 x 6 heated lagoon pool and covers 650m2 on a plot of 14.850m2. The villa (on the personal property of the owner post) sold furnished. Are you looking you a unique villa, then this is the one for you! Located between Hondón de las Nieves and Hondón de los Frailes 20 minutes from Elche and 30 minutes from Alicante airport and the Costa Blanca beaches.